Our studio policies are in place to help maintain the safety and professionalism of our studio. We ask that all students and their families who enter Broadway Arts Centre adhere to these policies both in and out of class. Students are asked to wear proper dance attire and hair must be tied back securely for each class. No jewelry is allowed. (Please refer to our dress code for suitable attire for each class). Students are not allowed to leave the studio without permission. No gum is permitted in the studio. Only water in bottles is permitted in the studio during class. Other food and drinks are restricted to the waiting area only. Please do not interrupt a class in progress. Parents are not permitted in the studios during classes. If a problem should arise with your child, please talk to the studio director directly. Please refrain from approaching other teachers. The studio director will handle any issues that may arise. Everybody misses classes for one reason or another, but it is important that you attend your regularly scheduled classes. If you do have to miss a class, we can offer you an alternative that week if available. There are no refunds for missed classes. From January onward, each class will be working on a specific routine and therefore it will be difficult to participate in make-up classes. The work that you are doing in your own class is very important and your attendance is essential. Absenteeism from March onward may result in the student’s limited participation in a recital number. The studio reserves the right to combine or cancel classes in the event of low attendance. The studio reserves the right to cancel classes due to inclement weather or other emergencies and no makeup classes will be issued. Please call the studio after 3:00pm and listen to the message on the machine if there is a question regarding class cancellation. An email will be sent out as well. 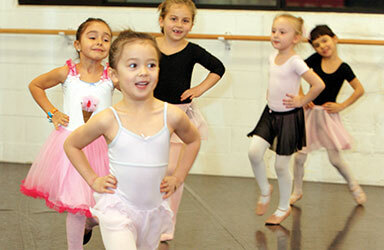 Each child will have 1 recital dance and costume per class that they participate in. Tickets and costumes fees are not included with monthly tuition. Recital costumes are ordered the week before winter break. Costumes must be paid for by the studio in advance, and once ordered cannot be canceled or returned. Sizes are selected based upon sizer-suits provided by the costume-makers at the end of November or beginning of December. “Two fingers” of growing room is allowed for all growing children. A non-refundable costume fee per costume is required by November 1st. Recital costumes are not custom, they are sized to fit the average person of that size. We usually “err” on the large side, as costumes are easier to take up than to let out. We make every effort to give each dancer the best fit possible with standard size costumes. Tuition is due by September 1st, December 1st and March 1st. Tuition is due regardless of holidays or absences. After 4 weeks of not receiving payment, your child will be unable to attend classes until payment is received. Statements will not be sent until an account is past due. Tuition is based on a term system, and is divided into three payments for your convenience. For this reason, no adjustment is made for “short” or “long” months. All returned checks receive a $25 charge to cover bank fees and processing. Tuition payment is expected until the studio is officially notified that a student has withdrawn by the parent/guardian. We must receive one month written notice for any cancellations. Classes are scheduled back-to-back. In an effort to run as close to schedule as possible, instructors will not be able to visit with parents or students between classes. All of our instructors will be happy to speak with you outside of class time. Please visit the reception area and leave a message and a convenient time for us to return your call. Students will be placed in classes that are most appropriate for their age and ability. It is important that students do not advance too rapidly, missing important training along the way. Class instructors will decide placement. Please refer to our schedule. Students should be dropped off and picked up within ten minutes of their scheduled class time. We are not staffed to supervise children for extended periods of time outside of the classroom. If you have an emergency or get caught in traffic, please call the studio so we can let your dancer know where you are. Proper dance attire is important so that our instructors can properly train their students, and is an important part of the discipline instilled in a young dancer. Proper attire and shoes are required for each class. Hair should be pulled back out of the face for all classes, unless otherwise specified by the instructor. Our dress code can be found on our website here. Be sure to label your belongings, and please do not bring toys, purses, cell phones or any other item in which you do not want to lose. Shoe bags/backpacks may be put into the change room provided. The Broadway Arts Centre is not responsible for any lost or stolen items. Unlabeled items we find will be placed in “Lost and Found”. They will be stored until it becomes full, then they will be given to Goodwill. Remember, if your lost item is labeled it will be much easier for us to return it to you! Broadway Arts Centre has free parking reserved at the front of the building as well as the back, after 5pm, and on weekends. There is also free one hour street parking on Golden Ave. The back parking lot can be accessed at the end of Golden Avenue. We want you and your dancer to stay informed so that you may both have an awesome dance experience. Expect periodic newsletters, which will be posted on our bulletin board in the lobby and will be emailed out. If we do not have your email address, please provide it to our office staff or sign up for our newsletter on our homepage. During the last class bi-month parents will be invited into the last 10-15 minutes of class to see their child’s progression. We will show some of the material we have been working on throughout the past few months. We understand the need to bring younger siblings to the studio, please supervise them so that classes are not interrupted and property is not damaged. We also would like to keep a pleasant lobby atmosphere. Please feel free to bring any questions, concerns, compliments or ideas to our attention as soon as they arise. We want this to be an outstanding experience for our students and their parents.